Temporary Teachers (BT Assistant / PG Assistant) - Salary will be paid as consolidated pay Rs.10000 per month - Age limit details : no age limit. retired teachers are also eligible to apply. Post Graduate Degree in any Subject with B.Ed. No. This recruitment is not for a regular post. 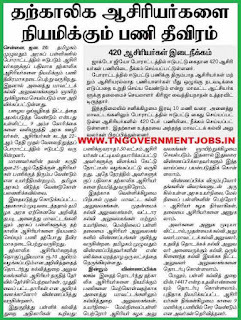 Temporary vacancies are find-out by the department due to the problem of JACTO-GEO teachers strike. Scale of Pay Salary or Consolidated Pay? 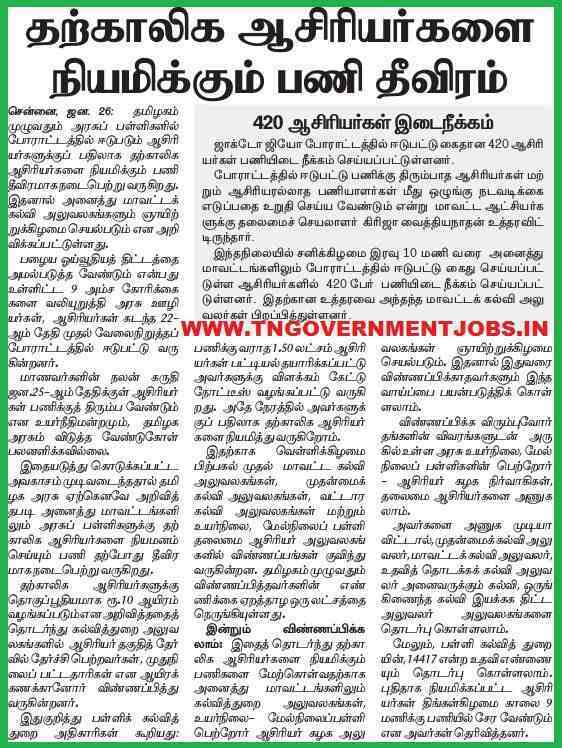 Initially Government of Tamilnadu announced Rs.7500 as a consolidated pay for the temporary teachers. Later, it has been increased as Rs.10000 per month. Immediately rush to the following address of your district concern. Head Masters / Head Mistress of the Government High Schools / Higher Secondary Schools. Office of the Chief Educational Officer (all Districts). I completed my M.Sc.Biochemistry but not B.Ed...Am i Eligible Mam. BEd is essential for BT / PG Asst Teacher Posts. Or at least you must cleared Teacher Training.